Gareth Evans admitted he'd be gutted if Ben Thompson's Pompey stay was cut short. The 23-year-old, who joined on a season-long loan from Millwall in the summer, has firmly established himself in Kenny Jackett's midfield. 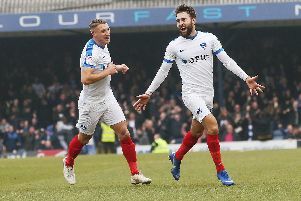 Since arriving from The Den, Thompson has made 19 appearances and netted once for the Blues as they top the League One table by four points going into today’s home game against Southend. Yet his influence in the Pompey battleground could come to an end sooner than expected. Lions boss Neil Harris is weighing up whether to recall him in January to help with a mounting injury list at the Championship outfit. A clause in Thompson’s Fratton Park loan deal allows Millwall to activate an early release if they see fit. Pompey team-mate Evans has been impressed with what the loanee has brought to the team this season. And he believes losing Thompson would be a huge blow. Evans said: ‘Ben’s been excellent for us. ‘He’s a really nice lad and he’s really good around the place. ‘Ben's an excellent footballer as well and brings a lot to the team. ‘I’ve really enjoyed playing with him, he's a really good lad and a really good player. ‘I don’t want to see him go. ‘I’d be a bit gutted if he went. Seeing at first hand what Thompson has to offer on the pitch, Evans added he was surprised the Blues managed to get him down to the south coast in the first place. His energy and assertiveness in the middle of the park – plus an ability to keep hold of the ball – has caught the Pompey skipper’s eye. And while Thompson’s goal return and assists – both one to date this season – could be improved upon, Evans believed the Millwall loanee was more than capable in that department, too. ‘I’m surprised he’s not getting a look in at Millwall,’ said Evans. ‘I’m sure that Millwall have got good players and they decide whether he goes out on loan or not. ‘But we’re really happy to have him and hope he stays to the end of the season. ‘He’s really strong and aggressive. ‘For his height he just seems to retain the ball and he can win it back, intercept and break forward with it. ‘Ben’s definitely got a few goals in him as well – he scores a few in training.